Got Hamilton fans in your house? 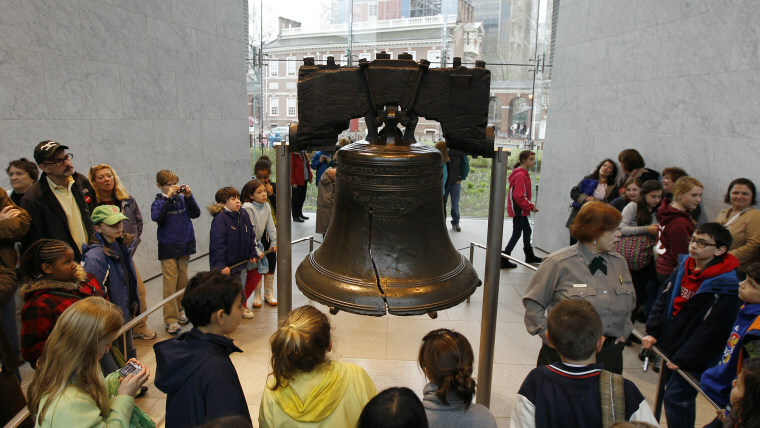 This lively, compact city, with its lovingly restored red-brick buildings and impressive mix of historical sites like the Liberty Bell and Independence Hall will help bring the Revolutionary Era to life. But even if your little ones could care less about A.Ham, there are plenty of things to keep them busy: kayaking on the Schuylkill River, which cuts through the western part of the city; walking the carriage roads in the expansive Fairmount Park; or taking a day trip to Sesame Place, an amusement park dedicated to Elmo, Ernie and the rest of the crew from the beloved PBS show. Art-loving parents will appreciate the Barnes Foundation's rich collection, which features works by artists like Renoir, Cezanne, Matisse, Picasso and more. But forget the art history: Toddlers and preschoolers will be all over the museum's kid-friendly activities such as guided stroller tours of the galleries, storytimes and arts-and crafts-sessions. Philly's status as a former U.S. capital is proudly on display at Independence Historical Park: It's worth devoting a day to its historic stops such as the Liberty Bell, Independence Hall (where the Declaration of Independence and the Constitution were signed) and the Benjamin Franklin Museum. The Please Touch Museum, which is geared toward kids ages 6 months to 7 years, is set in another worthy destination: Fairmount Park. The museum is located in a former World's Fair art gallery and features a restored 1908 carousel, an herb and vegetable garden, more than 25,000 toys on display and plenty of open space for kids to get the wiggles out. Just off elegant Rittenhouse Square, the Kimpton Hotel Palomar Philadelphia, which is set in a 1920s Art Deco building, will make you feel like you're lucky enough to live in the heart of Center City. Request a room on a high floor and you'll enjoy sweeping views of the Philly skyline. The hotel staff keeps its littlest guests happy with treats like animal-print bathrobes, weekend "Kids' Corner" sessions in the lobby (with candy and board games) and the popular Cookie Currency coupons handed out at check-in, which can be traded with the room service staff for a treat. The rooftop pool and warm chocolate chip cookies handed out at check-in are just two reasons kids will be begging to return to the centrally located Doubletree by Hilton Philadelphia Center City. The hotel's location is unbeatable, as it's an easy walk from both Independence Park and Rittenhouse Square, and directly across the street from the subway should you want to venture further. The kids' menu at the bustling, well-located Marathon on the Square (as in Rittenhouse) is no afterthought, and includes matzoh ball soup and chicken parm, as well as classics like chicken fingers. (Of course, kids who can read may beg for the chocolate chip cookie dough pancakes from the regular menu.) This Philly mini-chain is known for its big portions, relaxed atmosphere and large menu with enough choices to please everyone, whether they want breakfast (served all day), a "control freak" customized salad or a decadent appetizer like the cheesesteak wontons, a fun riff on a local favorite.